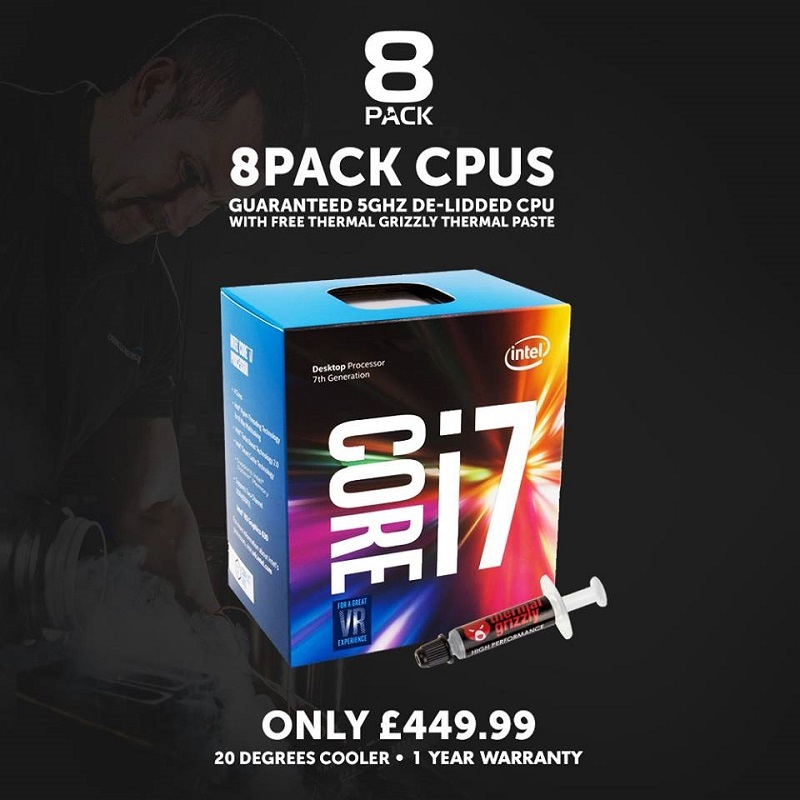 Overclockers UK has now released custom de-lidded Kaby Lake i7 7700K CPUs, which comes pre-benchmarked for a guaranteed 5+GHz overclock and compatibility with 4000MHz+ DDR4 memory. Read more on Overclockers UK's pre-binned De-lidded 5GHz i7 7700K CPUs. Would you spend more on a guaranteed high CPU overclock? I wonder what they do with all the chips that they break the seal on and don't get over 5GHz..
Perhaps that explains that completely mental price premium? Perhaps they go into a pre-build with a 4.8GHz clock? Hard to know. They could send them all to me if they like. Hey Tom! You should defenetly try to have a sample from these chips and overclock the hell out of it. The i7s are out of my reach, but because of that I find it so amusing to someone else push it to limits. Then I start drooling for a system lick this. But you should defenetly do a "Extreme i7 Overclocks!" video, I would defenetly watch it. Apparently all the chips that are cherry picked from are not retail in the first place. So they guarantee only for non avx applications ! So does this mean if an AVX application is launched then the cpu risks freezing the system ?? This is not stable in my opinion and is a rip off !! They should be rating these cpus for avx stable and not most other application stable. AVX can be a problems for some CPU overclocks, though some BIOS' now can automatically downclock a CPU when in AVX mode. For example run at 5GHz and then 4.8 when AVX modes are used. Why is AVX so hard on CPUs? There is a web site that sells cherry picked CPUs. I wonder if OC buy in bulk from them or similar, delid to drop temps and then add a little extra cost as a mark up.